NEWPORT, R.I. — Olympic gold medalist and 21-time grand slam doubles champion Pam Shriver, two-time US Open champion and former world No. 1 Tracy Austin, and Brad Parks, the pioneering founder of Wheelchair Tennis have achieved success at the greatest levels of tennis and have all left a lasting, positive impact on the sport. In recognition of their success and contributions, the three stars have already been honored with the highest honor in the game — induction to the International Tennis Hall of Fame. In a special ceremony today at the Farmers Classic, presented by Mercedes-Benz in Los Angeles, this important achievement was celebrated once again with the presentation of their official Hall of Fame rings. The newly developed, one-of-a-kind rings are being presented to Hall of Famers at tennis events around the world over the next several years to mark their achievement of Hall of Fame induction. Ring presentation ceremonies have taken place recently in Delray Beach, Fla., Houston, Barcelona, and during the annual Hall of Fame Induction Weekend in Newport, R.I. The personalized rings bear a green stone set in gold, to complement the Hall of Fame’s brand colors. In addition, the rings are etched with each honoree’s name and the Hall of Fame logo crest. “Pam and Tracy have won the most coveted titles in tennis, and are among the most talented, successful women in the sport. Brad has made tremendous contributions to tennis, by increasing its accessibility and inspiring wheelchair tennis players worldwide. Pam, Tracy and Brad are among the greatest champions and most influential contributors to tennis, and as Hall of Famers they are already among an elite group of tennis legends. We are pleased to be able to recognize this achievement with this special ring, which only the most successful and influential individuals in tennis will have the honor of wearing,” said Christopher E. Clouser, chairman of the International Tennis Hall of Fame & Museum. Clouser presented the rings to Shriver, Austin and Parks on Center Court at the Farmers Classic, presented by Mercedes-Benz, just prior to the tournament finals. Also participating in the ring ceremony were Tournament Director Bob Kramer and Tournament Chairman Franklin Johnson, who served as president of the Southern California Tennis Association and the United States Tennis Association, and is a member of the Board of Directors of the International Tennis Hall of Fame & Museum. The International Tennis Hall of Fame rings have been generously underwritten by The Bruce T. Halle Family of Scottsdale, Arizona. Bruce, founder of Discount Tire, and his wife Diane, a philanthropist, are tennis enthusiasts and they have generously supported communities in the areas where Discount Tire is located, and beyond, for many years. A young prodigy of the sport, Tracy Austin, caught the world’s attention as a junior when her remarkable poise, precision and determination to be a champion became apparent as she repeatedly claimed national titles. Austin turned pro at 15 years old, and in 1979, when she was 16 years and 9 months old, she upset Chris Evert to win the US Open, becoming the tournament’s youngest ever champion. In 1980 she claimed the Wimbledon mixed doubles title with her brother John, the only siblings ever to do so. Austin achieved the world No. 1 ranking in 1980 and defeated Martina Navratilova in 1981 to capture her second US Open title. In the years that followed, injuries cut her career short, but she remains involved in the sport as a tennis commentator. Austin was inducted to the International Tennis Hall of Fame in 1992 at just 29 years of age- the youngest inductee ever. Doubles legend Pam Shriver captured a remarkable 21 Grand Slam doubles titles during her Hall of Fame career, 20 of those with fellow Hall of Famer Martina Navratilova. In 1988, she earned an Olympic Gold Medal, when partnered with Zina Garrison at the Seoul games. Shriver attained a doubles ranking of world No. 2 and won 106 WTA titles during her career. She achieved success in singles as well, capturing 21 titles and achieving a world No. 3 ranking. Shriver was honored with induction to the International Tennis Hall of Fame in 1992. Brad Parks, the pioneering founder of wheelchair tennis, was inducted to the International Tennis Hall of Fame in 2010- the first wheelchair tennis player to receive the honor. In 1976, Parks began playing tennis as a method of physical therapy, ultimately developing the sport in the process. Despite being told that growing wheelchair tennis would be impossible, Parks forged ahead and today it is played at all four Grand Slam tournaments, at the Paralympics and in nearly 100 countries around the world. Professional wheelchair tennis players compete on the NEC Wheelchair Tennis Tour, which is comprised of more than 150 tournaments in 41 countries and exceeds a total of $1.5 million in prize money. 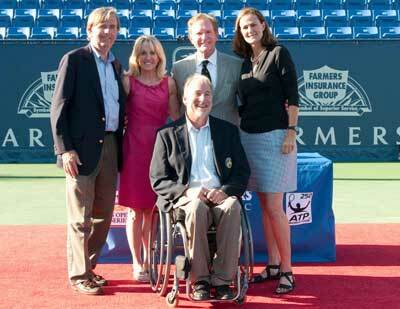 Parks founded the first US Open for Wheelchair Tennis in 1979 and served as Tournament Chairman for 18 years. He is a three-time US Open Wheelchair Tennis singles champion, a seven-time doubles champion and he earned a gold medal in the 1992 Paralympic games. Additional International Tennis Hall of Fame rings will be presented at tennis events around the world in the coming years. Presently, there are 85 Hall of Famers living in 16 different countries, a testament to the global reach of the game. Upcoming ring presentations are scheduled for the Legg Mason Tennis Classic in Washington, D.C. and other events to be announced. Located in Newport, Rhode Island, the International Tennis Hall of Fame is a non-profit institution dedicated to preserving the history of tennis and honoring the game’s greatest heroes. The International Tennis Hall of Fame has inducted 220 individuals from 19 different countries since 1955. In addition, the Hall of Fame provides a landmark for tennis enthusiasts, offering an extensive museum that chronicles the history of the sport and its stars, historic grass tennis courts that date back to 1880 and are open to the public, an ATP World Tour tournament and the annual Hall of Fame Induction Ceremony in July, and numerous public events year-round. To learn more, visit tennisfame.com.